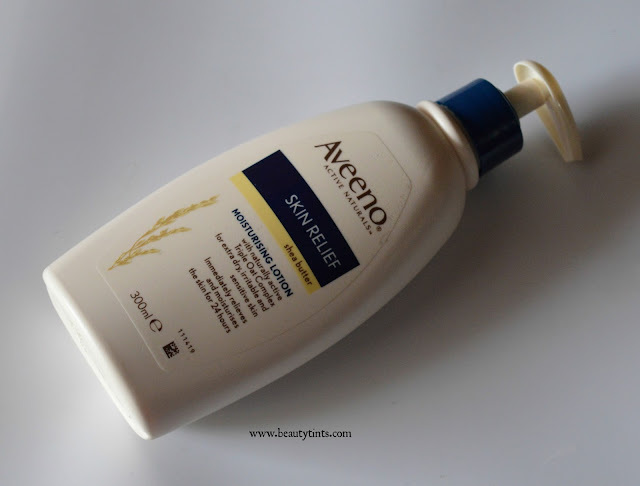 Sriz Beauty Blog: Aveeno Skin Relief Shea Butter Body Lotion Review!!! 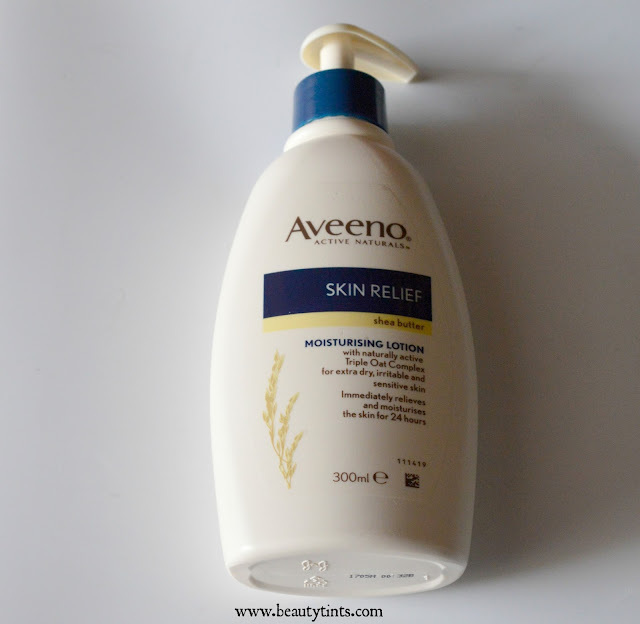 Aveeno Skin Relief Shea Butter Body Lotion Review!!! Today I am reviewing Aveeno Skin Relief Shea Butter Body Lotion,which is one of the best body lotions I have used so far!!! 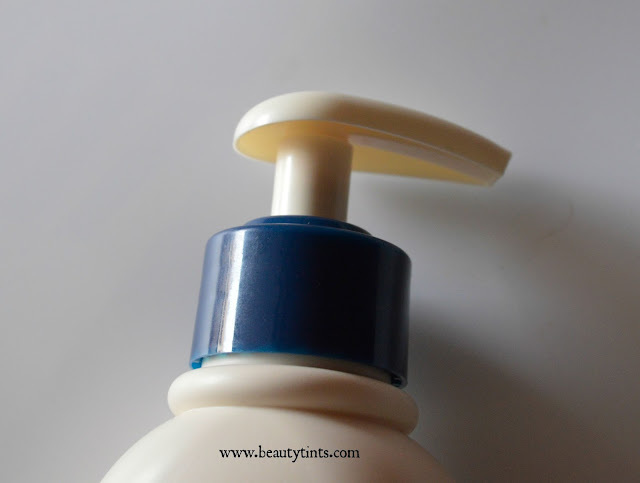 Packaging :This body lotion comes in a sturdy bottle with a pump dispenser with lock. Formulated with Shea Butter and a unique Triple Oat Complex containing finely-milled, naturally active Oats, Oat oil and Oat essence to immediately relieve extra dry and irritable skin.Skin is left looking and feeling soft,smooth and healthy.Fragrance free and fast absorbing. Paraben free,Dermatologically tested for sensitive skin. Ingredients : Aqua, glycerin,Distearyldimonium chloride,Petrolatum,Isopropyl Palmitate,Cetyl alcohol,Dimethicone,Avena Sativa Kernal FLour,Avena Sativa Kernel oil,Avena Sativa kernal extract, Butyrospermum parkii butter, Stearyl alcohol, Myristyl Alcohol, Steareth-20,Isopropyl Alcohol, Sodium Chloride, Potassium Sorbate, Benzyl alcohol. 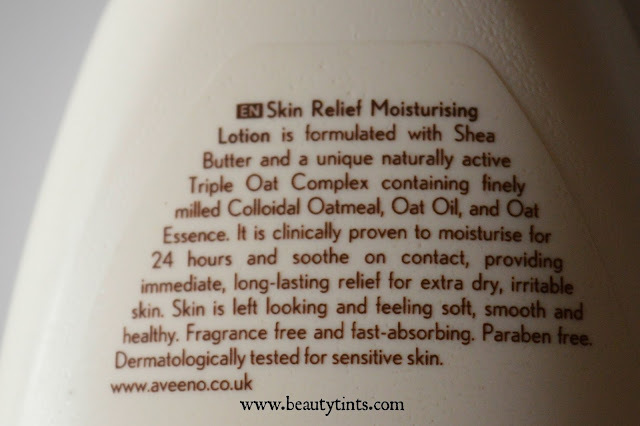 My View On the Product : The Aveeno Body lotion comes in different variants and I have two variants with me one is this Shea Butter Variant and other one is the daily moisturizing lotion. 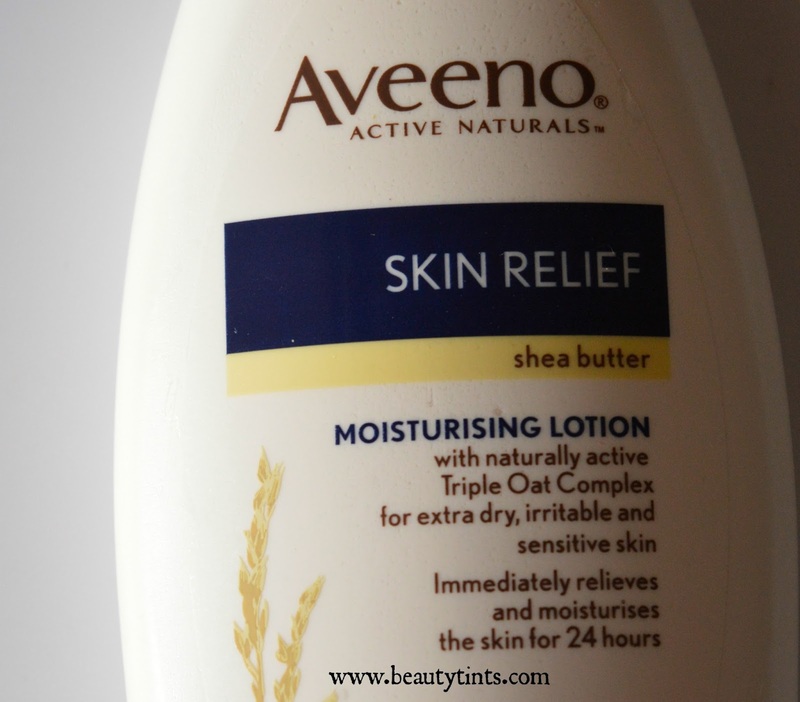 This Shea butter variant is a bit thick compared to the daily moisturizing lotion.This Skin relief shea butter moisturizing lotion comes in a sturdy cream colored bottle with a pump dispenser with locking system,which locks perfectly and is good for travelling.The body lotion is absolutely fragrance free,it gets absorbed instantly with out leaving any greasiness or stickiness behind.It moisturizes very well for long 7-8 hrs with out the need of re-application.This is enriched with the goodness of flour,oil and extract of Oat kernels along with the rich moisturizing properties of Shea butter.This is paraben free and dermatologically tested.It helps in reducing the itchiness and dry patches with in 2-3 days.It helps in making skin smooth and soft even in harsh winters.It may not suit for summers.It is a bit pricey but it is worth every penny.A little goes a long way and so one bottle easily lasts for 3 months even after using daily.The only con is the availability.It is available only from very few online sites here. Final Conclusion about Aveeno Skin Relief Shea Butter Body Lotion !!! 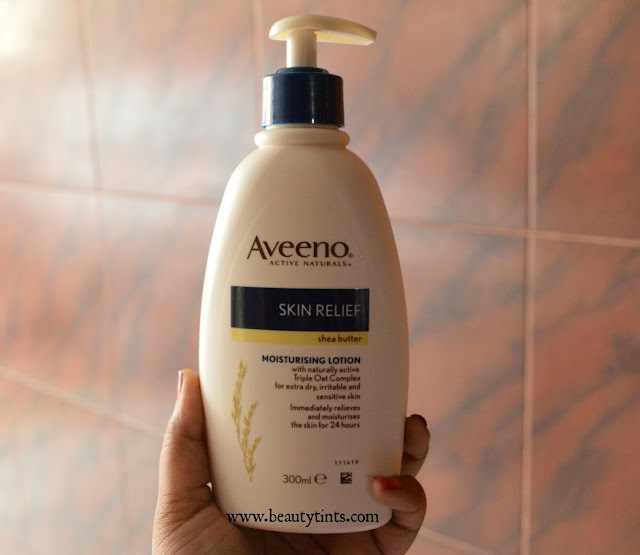 : Overall,a wonderful paraben free body lotion that relieves itching,dryness of skin with in short time and is enriched with the goodness of oats and shea butter!! !